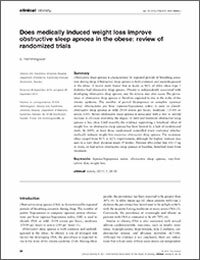 Hemmingsson, E. (2011 February) Does medically induced weight loss improve obstructive sleep apnoea in the obese: review of randomized trials. 1 (1), 26-30. doi:10.1111/j.1758-8111.2010.00004.x. Does medically induced weight loss improveobstructive sleep apnoea in the obese: review ofrandomized trials.